an article including CodeCity. Nice. Which OS do you use for running Pharo. Here is the poll. Dram 242 is nominated for the Belgian Whisky Awards 2015 in the category Whisky Shop of the Year! The online shop is powered by Smalltalk. DynaCase, UML modelling in Pharo with ROASSAL. Look at the project on GitHub or the pics in Twitter. A quality assistant run SmallLint rules on the code that you modify, and notify about the critics right in the system browser of Pharo. Read more. anytime you run it. And a test.txt.seq with the current number. Useful. SmallWorlds is a framework for Text Adventure Games In Smalltalk originally from Dolphin Smalltalk. Looks like it is now ported to Pharo. Bordician is a Pharo framework for building board games in Pharo. Read here and here. Kendrick DSL v0.15 is out: new syntax, more than 30 epidemiological models included. Checkout the page. If you want to help beta testing Pharo 4.0 then visit this page. Viva - a minimal framework for animations in Pharo. 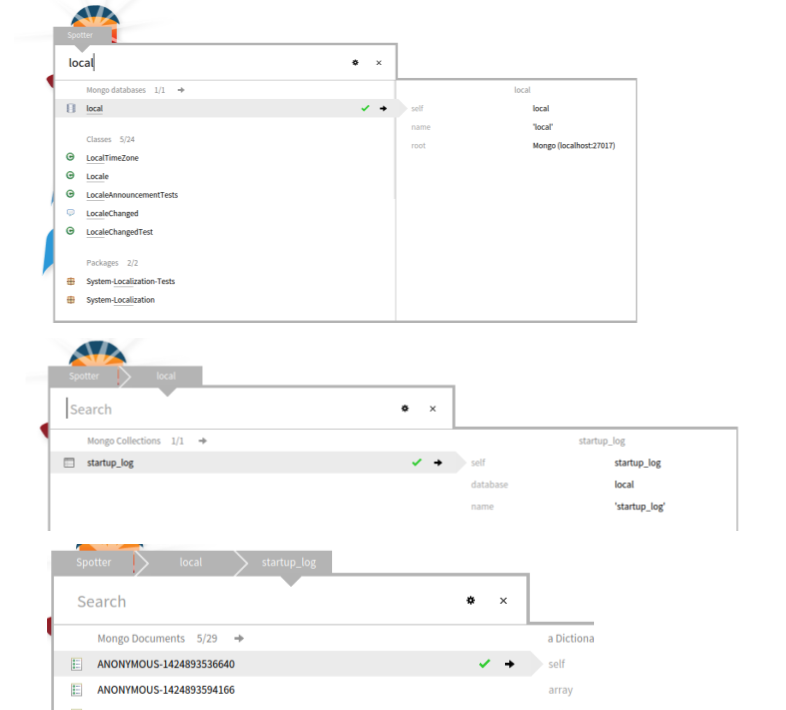 Want to use Pharo to easily discover Google Services? Then read this nice blog article. Beside my new article "Building a Mongo Browser in Pharo" and the new Mongo Browser tool I now added support for "Spotter browsing/navigation" using a running Mongo DB instance to the project. Just load "MongoTalk" from config browser in Pharo 4, run you Mongo database and then use Spotter to enter/search a database name. When Mongo is running locally you can directly use spotter to browse Mongo databases, included collections and documents. There is a A4BP (Assessment for Bussines Process) project to visualize data from BPM using Rossal and Moose on top of Pharo. Another new article on how to use the new GT Tools in upcoming Pharo 4. A simple web page list to browse the SmalltalkHub projects. A Stream-based, Seaside-inspired framework for creating and manipulating contents of a page. Read more here, code is on GitHub. "Since every polite person talks in sentences, Polite Smalltalk is a programming language which encourages developers to name their method names in the most natural manner.". Read more here. Sean DeNigris is working on a Self like infinite live editing IDE in Pharo Smalltalk. Video is here and code here. Looks like there is some BPEL visualization with Roassal and Pharo in the pipe. A Pharo binding for J by Martin Saurer. J is a general-purpose, high-performance, array-oriented programming language which is particularly strong in data analysis. "Back in the good old Pharo days" (TM) I once wrote a simple help tool so we could provide a better infrastructure to browse documentation inside of the image. The idea was as simple and minimalistic as the domain model: basically anything one requires is a HelpTopic class with a title and contents. Any help topic can have subtopics so in the end they form a substructure of books with chapters. Additionally I implemented a simple HelpBrowser tool that can browse the help tree. Later some additional tools where added like editing the help contents or creating topics from wiki style syntax. If I'm not mistaken the simple help tool is also used in Squeak. This week I played with the new GTTools in Pharo 4 (GTInspector, Spotter) and added some specific inspectors for the help topics. After e-mail conversation with Andrei Chis and Tudor Girba this was extended even more. The result is described in this nice blogpost. It shows how powerful the adoptable GT tools in Pharo 4beta already are. More to come like including the search of help title/contents in the spotter tool. http://files.pharo.org now cached as Marcus just announced. A playground for drawings with Athens written by Nicolai. Read more. More Smalltalkers are still required to fill jobs worldwide like in Sydney or Berlin. But I'm sure Open Source Smalltalks like Pharo will change this to bring more people to this amazing technology. Did you know how the enumeration method names came into Smalltalk? If not read here and afterwards listen to this song. Slides from Yuriy Tymchuk on "Code Review: Veni, ViDI, Vici". The ViDI (Visual Design Inspector) tool can be seen here. It still less than 700 Lines of code and a nice micro web framework for Pharo. You need to load "ConfigurationOfTeapot-AttilaMagyar.6", if you are on Pharo 4 you can directly load it from the configuration browser. As this framework is very easy to use (it bases on the concept of URL routes): you can serve dynamic or static HTML pages, JSON and other web related stuff easily from Pharo. It is nice especially if frameworks like Seaside are too heavy for your web application needs. Pharo 4.0 also includes some more AST Link Annotation Infrastructure. Read more. Language Detection API is a service to query the language of a given input text. You can use it from Pharo. Read more.